The AZUB Six strikes the balance of speed, comfort, ease of use and versatility. It offers a wide choice of component spec and configuration. 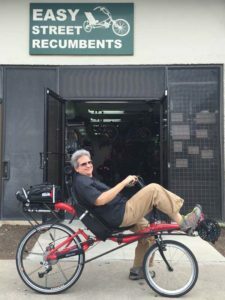 The 20/26 short wheelbase recumbent (20” front wheel, 26” rear) is standard sight among recumbent choices, giving the speed of the 26” rear wheel and easy access of the 20” front. The AZUB Six, named for being the 6th incarnation of their 20/26 SWB design, doesn’t have a very clever name, but don’t let that stop you. 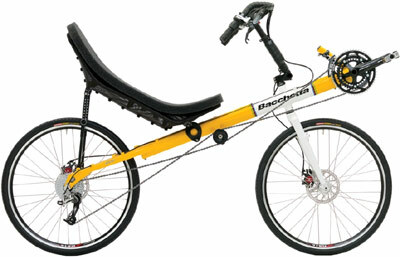 This bike strikes the balance of speed and easy of use. Set it up for comfort with full suspension. Like all the AZUB bikes you have your choice of under seat steering, over-seat “praying hamster” steering (like on a Lightning), or over-seat “open cockpit” steering (like on a Bacchetta). While the 20″ front wheel doesn’t climb over obstacles as well as the 26″ front wheel on the MAX. 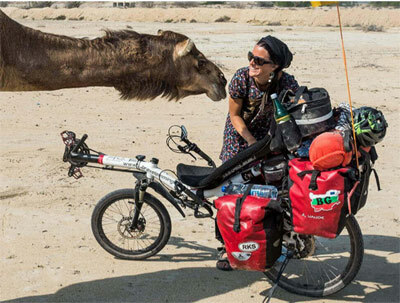 Still, it is AZUB’s recommendation for an all-purpose touring bike. The 20″ front wheel makes stops easier. On extended tours with loaded packs, long days and questionable weather you want such things to be easy. Starts are also easier when you can plant a foot securely on the ground. Our service manager Laurie rides a Six, finding it easy to ride despite her short legs. But then she’s a mechanic and actually seems to spend more time tinkering with hers than riding it. 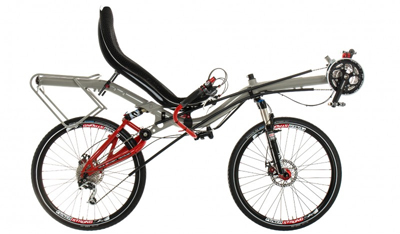 AZUB SIX is the ultimate universal bike we have on offer. It is comfortable, ergonomic, efficient and beautiful, nimble enough for the city and stable enough for long straight roads. Its robust frame, semi-integrated headset, stiff rear fork and a fixed rear rack make it a durable bike suitable for everyday commuting as well as for expeditions tens of thousands of kilometres long. However, each bike we have on offer is built according to the customer’s wishes, so we can also configure the SIX in such a way so that it offers plenty of comfort and speed for some pleasant afternoon or weekend outings. Which means you will be able to experience all the amazing features that AZUB SIX offers to extreme riders too. 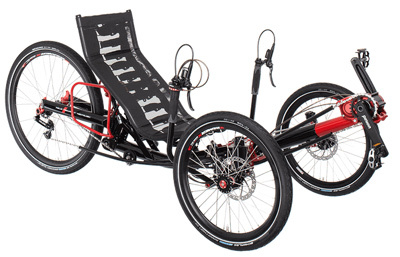 For us, the SIX is the epitome of the entire evolution of our recumbent bikes. Our first prototype had a 20” front wheel and 26” rear wheel so we can really call it the AZUB Zero. Since then we have continuously refined it, looked closely at every single detail, and each and every experience we ever got we have transformed into an improvement. At first, we would come up with major innovations every year and the name of this model would change according to the given year – 2002, 2003, then AZUB 4 and AZUB 5. In 2005, we were happy with our Top Line models and for the next six long years we only focused on minor improvements. Then in 2011, we introduced an improved asymmetric fork along with other new technical details, but the new name of AZUB SIX didn’t come out until 2013. 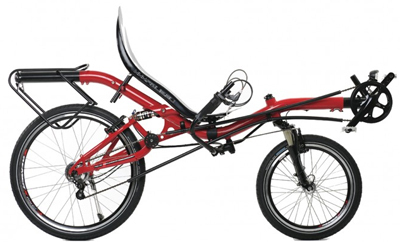 Ever since then, the SIX as well as all other AZUB recumbents have a sliding sleeve for the precise adjustment of the seat counting in millimetres, a superb system for the smooth and firm adjustment of the seat angle with locking nuts, improved mounting for the rear rack and revised geometry for even better riding experience. Boring technical specs from AZUB follow, along with our interesting comments. Barring idiosyncrasies, OSS is for touring or commuting, USS is for off-road or just being radical, and OC is for long highway rides. Suspended will sit you a little higher. Leaving this bike without full suspension seems like a half-measure, but you get your choice. Complicated way of saying this isn’t cheap crap. Available in a variety of sizes based on your torso length. Open cell foam that is more comfortable than it looks. More upright improves starts and stops and increases leverage on pedals. More reclined improves comfort and aerodynamics. And they’re damn proud of it. About 5″ of ex-seam range, with seat recline adjustment widening that range a little. The frame will telescope out about 8 inches. The adjustable frame coupled with the adjustable seat let you optimize both arm reach to the bars and leg reach to the pedals. Your AZUB will be optimized for your ex-seam, whatever it is. See our ex-seam guide here. Very short people would not be able to reach the ground on this model, but beyond that if you tell them your ex-seam AZUB will build it to fit. This is how far apart the hub axle are from each other. Less means more maneuverability. OSS and OC bars are interchangeable with similar bars for customization. USS will adjust somewhat. Just what adjusts depends on steering type, but you’ll get a lot of control over the fit. Slick tubing for guiding the chain.